At the time this post is being published, two friends (Juan and Jose), my brother and I are about to start the Marathon of Sevilla. To prepare this marathon I followed the same 16-week long training plan I used for the previous two marathons (Rotterdam and New York). However, the 1st day of the plan was on November 3rd, just the day after we completed New York marathon. Thus, I took a week of full rest and another 3 of almost no running, and I started following the plan at full throttle only from week 5, beginning of December. From December till February 15th (when writing this post) I have completed over 616km (650km including those few in November) in 11 weeks, or about 56km per week. I have completed about 20 sessions of series training, I ran 9 long runs over 17km (6 of them over 27km, 2 over 33km), I did not take part in any race but during training sessions I managed to clock my 5th best time over 10km and my 2nd best time over 21.1km (half marathon). I am close to the fastest shape that I have been in the last year, and have no doubt followed the best training season so far. 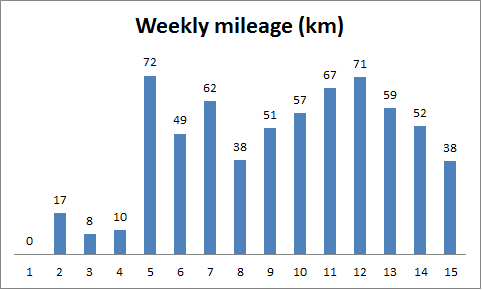 Weekly mileage completed along the training plan for Sevilla. In between, I switched training shoes, so I will run with shoes with less than 150km though more or less used to the shape of my feet. Back to the race. 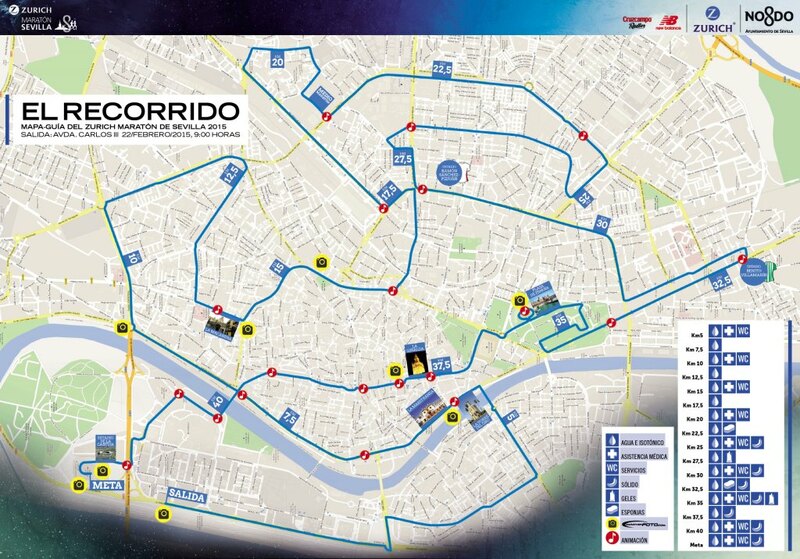 We will cover the 42.195km by running all around Sevilla. This marathon will be somewhat special to us since it will be the first one we will be running together all of us in Spain. It will also be special as both my brother and I lived for a year in Sevilla while studying and working (not simultaneously though). It will start in Isla de la Cartuja (where we studied at EOI) to go South towards Triana and Los Remedios. At km. 4 will turn left to take Av Republica Argentina just 4 blocks where our cousin lives. We’ll cross the river and turn left to go along the river for about 8km, passing Torre del Oro, La Maestranza (bullfighting arena), Av Torneo all the way to the Puente del Alamillo (we’ll be passing the cinemas we used to go, places where friends used to live, etc). At km. 14 we’ll pass by La Macarena, where Jaime used to live. Shortly after we’ll take Luis Montoto heading towards the hotel we normally stay when on business, where more friends used to live, etc. Then we’ll take Kansas City avenue to the North for another 2km. Shortly afterwards we’ll cross the half marathon mark. The next 7 km will cover parts of the city I don’t know that well, therefore it will be perfect time to focus on the pace, drinking and eating. At km. 28 we’ll take Luis de Morales street, where I use to train when on business in Seville. At km. 32 we’ll pass by the football stadium of Betis and then take the Paseo de la Palmera for 2km until Parque de Maria Luisa and Plaza de España, two of the most beautiful spots of the city (which I also go by when training in Sevilla). From then on, the last 6km I guess that are going to be overwhelming: the race will go through the very centre of the city (the University, the Cathedral (La Giralda), the city hall, Av Constitucion, Tetuan, Trajano, Alameda de Hercules), by then it will be about noon and more people will be on the streets cheering the runners. Hopefully, by then, we’ll still be in good shape, fighting for the objective and enjoying the experience. This tour through the centre will end at the Puente de la Barqueta to cross the river and cover the last 2km in Cartuja before reaching the Olympic stadium where world athletics championship of 1999 took place. And what will be my objective? Since I mentioned that I arrive at this race with the best training so far (as does my brother), we’ll depart trying to stay with the pacer of 3h30′ all along the way and thus clocking a time under that mark, which for me (and possible for Jaime) would be a personal best. The race is quite flat and if the day does not turn out too hot, the conditions should help us to achieve that goal. To support us along the race we’ll count with the direct families (Inma, Luca, Andrea), extended family, friends that come from Madrid explicitly to cheer us (Elena, Maicol) and possibly some others we may see along the race.